A few weeks ago, I woke up one Saturday morning to an empty peanut butter jar. I hadn’t realized I didn’t have a back up (obsessed much?) and had just been at Costco the day before (which is where I buy my PB) so I really didn’t want to head to the store again. 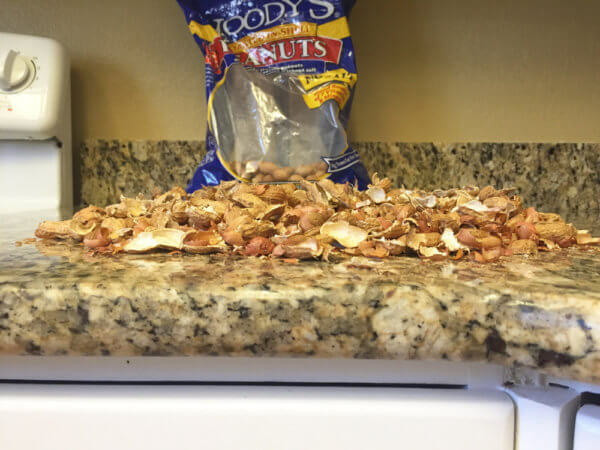 However, at the beginning of the summer I bought a big bag of unshelled peanuts because I thought it would be a fun snack for my kids. They’ve eaten them, but we weren’t moving through the bag very fast so I decided to get busy and make my own peanut butter. 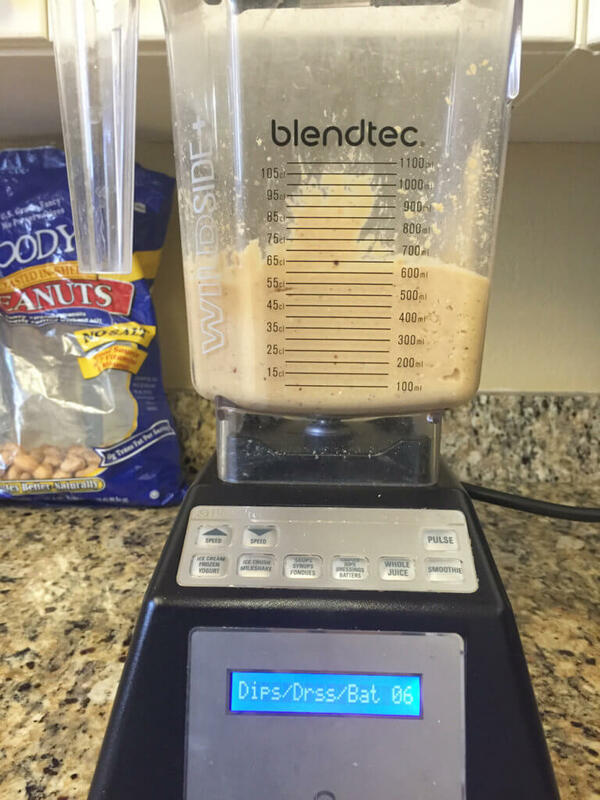 The first time I made this I just shelled them until I had about 3 cups of unshelled peanuts and then blended them until creamy in my Blendtec. 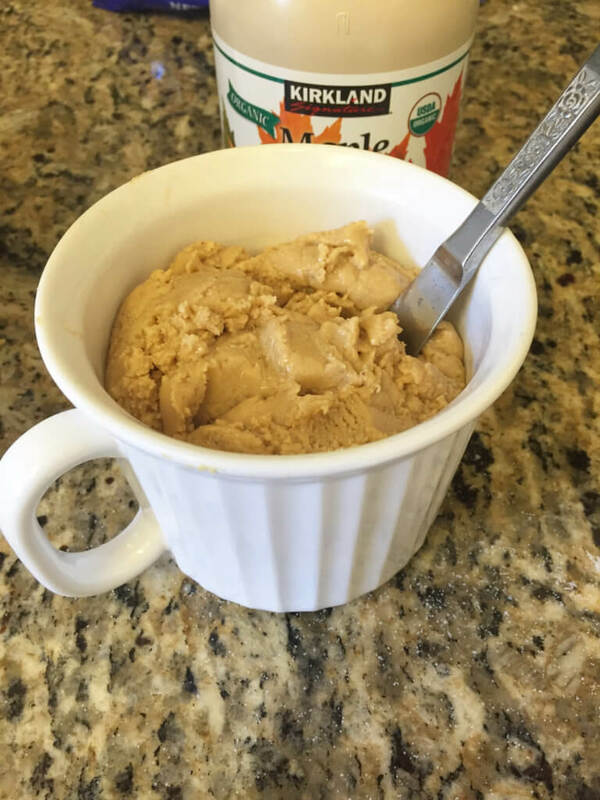 It was yummy – because PEANUT BUTTER – but I also thought about how tasty it would be with some salt and maple syrup. You should know this about me before I go on – my absolute most favoritest flavor combination in the whole entire world is peanut butter + maple syrup. It’s why I love THESE COOKIES and why most of my breakfasts are THESE PANCAKES with PB, a drizzle of maple syrup and blueberries or banana. Anyway, when I ran out again, I made my dreams come true. But I took it up a notch by adding another type of nut – Brazil nuts. Now honestly I mostly added them because it meant less shelling (have you ever shelled 3 cups of peanuts? It takes about an hour and your thumbs will be SORE). I also added them because they are kind of a nutritional powerhouse, at least in terms of selenium. Did you know that one brazil nut has all the selenium to meet your recommended intake each day? Selenium is a trace mineral, is considered an antioxidant and plays critical roles in reproduction, thyroid function, DNA synthesis, and protection from oxidative damage. Because of it’s role in immunity and DNA repair, it may help in prevention of certain types of cancers. I try to find a way to eat a Brazil nut each day anyway so this seemed like a win-win. Before you think peanuts aren’t nutritious in their own right, they have been shown to be just as effective at lowering risk for heart disease as eating any other type of nut but also having the benefit of being less expensive than other types of nuts. They are also the highest in protein of any nut (they are actually a legume but nutritionally are more comparable to nuts and seeds). Peanuts are one of the richest sources of Biotin which is a B vitamin most notable for helping the body convert food into usable energy, and particularly essential during pregnancy. In my opinion peanut butter is also deeeelicious and the perfect combination of protein and fat, making it super satisfying. Adding the Brazil nuts definitely made it less creamy then the first time I made it. It’s a little thicker, which I don’t consider a bad thing. 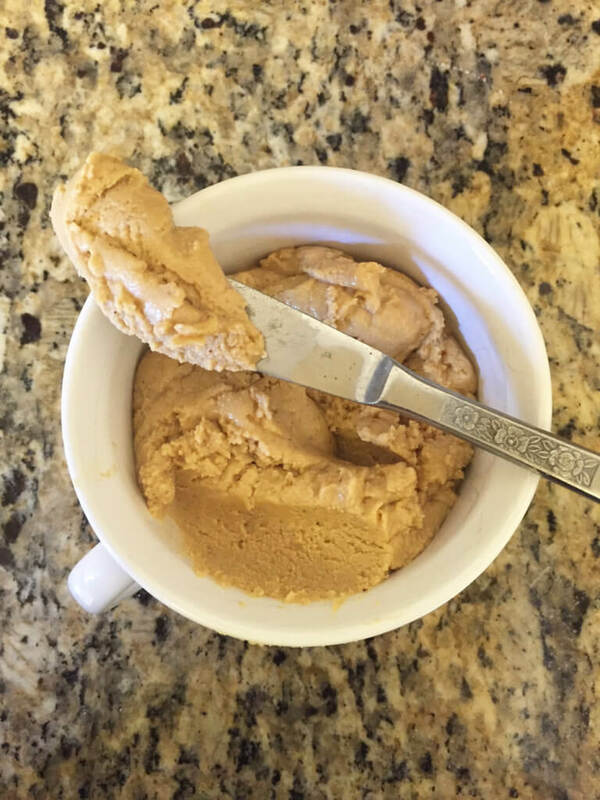 If you want more creamy and traditional peanut butter, feel free to leave the Brazil nuts out and do 3 full cups of peanuts. You also don’t have to shell yours, you could just buy them already shelled. But then you miss out on half the fun! 🙂 I originally planned to use 1/4 cup maple syrup but found that 2 tbsp was the perfect amount of sweetness for me. If you want it a little sweeter, add another 1-2 tbsp. Combine peanuts and brazil nuts in a food processor or high powered blender. Blend until creamy. If using a Blendtec, I used the sauces/dips/dressings function. You may need to stop it and scrape the sides before turning it on again. Be patient, it will turn into butter soon enough! Once it has, add maple syrup and salt and blend until combined. 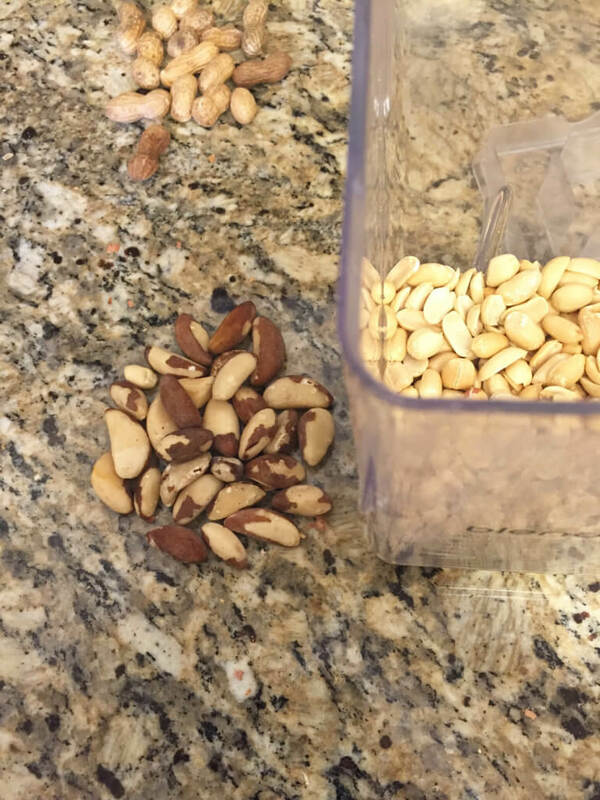 Combine peanuts and brazil nuts in a food processor or high powered blender. Blend until creamy. If using a Blendtec, I used the sauces/dips/dressings function. You may need to stop it and scrape the sides before turning it on again. Be patient, it will turn into butter soon enough! Once it has, add maple syrup and salt and blend until combined.